January 13, 2010 - The Vietnam War, also known as the Second Indochina War, was a Cold War military conflict that occurred in Vietnam, Laos, and Cambodia from September 26, 1959 to April 30, 1975. Officials with the Department of Defense POW Missing Personnel Office announced January 12, 2010, that the remains of an Air Force pilot, missing in action from the Vietnam War, have been identified and will be returned to his family for burial. Maj. Russell C. Goodman of Salt Lake City, Utah, will be honored at Nellis Air Force Base, Nev., home of the U.S. Air Force Thunderbird demonstration team. At the time he was lost, Major Goodman was assigned to the Thunderbirds and was flying with the U.S. Navy on an exchange program. He will be buried in Alaska at a date determined by his family. On Feb. 20, 1967, Major Goodman and Navy Lt. Gary L. Thornton took off in their F-4B Phantom from the USS Enterprise for a bombing mission against a railroad yard in Thanh Hoa Province, North Vietnam. They were struck by enemy antiaircraft fire and their plane exploded. Lieutenant Thornton was able to eject at just 250 feet altitude, but Major Goodman did not escape. Lieutenant Thornton survived and was held captive until his release in 1973. 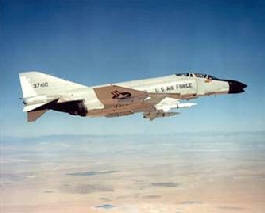 The remains of an Air Force pilot, shot down over North Vietnam in 1967 while flying an F-4 Phantom like the one shown here, have been identified and returned to his family for burial. Search and rescue attempts were curtailed because of heavy anti-aircraft and automatic weapons fire in the area of the crash. Between October 1993 and March 2008, joint U.S.-Vietnamese teams led by the Joint POW MIA Accounting Command investigated the crash site twice and conducted two excavations, recovering human remains and pilot equipment. The aircraft debris recovered correlates with the type of aircraft the men were flying. Among other forensic identification tools and circumstantial evidence, scientists from JPAC and the Armed Forces DNA Identification Laboratory also used mitochondrial DNA, which matched two of his maternal relatives, in the identification of Goodman's remains. The Vietnam War was fought between the communist North Vietnam, supported by its communist allies, and the government of South Vietnam, supported by the United States and other anti-communist nations. The Viet Cong, a lightly armed South Vietnamese communist-controlled common front, largely fought a guerrilla war against anti-communist forces in the region. The North Vietnamese Army engaged in a more conventional war, at times committing large units into battle. U.S. and South Vietnamese forces relied on air superiority and overwhelming firepower to conduct search and destroy operations, involving ground forces, artillery and airstrikes. The United States entered the war to prevent a communist takeover of South Vietnam as part of their wider strategy of containment. Military advisors arrived beginning in 1950. U.S. involvement escalated in the early 1960s, with U.S. troop levels tripling in 1961 and tripling again in 1962. U.S. combat units were deployed beginning in 1965. Operations spanned borders, with Laos and Cambodia heavily bombed. Involvement peaked in 1968 at the time of the Tet Offensive. After this, U.S. ground forces were withdrawn as part of a policy called Vietnamization. Despite the Paris Peace Accords, signed by all parties in January 1973, fighting continued. The Case-Church Amendment, passed by the U.S. Congress in response to the anti-war movement, prohibited direct U.S. military involvement after August 15, 1973. U.S. military and economic aid continued until 1975. The capture of Saigon by North Vietnamese army in April 1975 marked the end of Vietnam War. North and South Vietnam were reunified the following year. The war exacted a huge human cost in terms of fatalities, including 3 to 4 million Vietnamese from both sides, 1.5 to 2 million Laotians and Cambodians, and 58,159 U.S. soldiers.